Page 2 - Do you like this feature? regarding clothes or animations, it seems that there's not an official policy, so if it's allowed, but I think that common sense should be used in these cases. That's: if you prominently display a content made by other developer (example you wanna sell a closeup picture that show off details of a dress made by a second life designer), I think you should ask permission to him. Hey Marlia, indeed, let me tell you that it's not so complicated. Those complications are exactly why my "Tales of Eternity Isle" project has been so slow to launch, I realized early on that nearly all content on my set would need to be made by myself or a member involved in the production, and if I wish to use content created by others get an agreement and offer a film credit in the end titles as well. Currently I have physical prints available for sale but I don't wish to use any web based service (zazzle, cafepress, lulu). Maybe I look for some SL pics I would like to try to sell and ask the designers. But it is not only clothes - also the skin and hair maybe........lol. 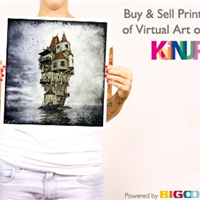 you'll need to join Sell & Buy Prints of Virtual Art on Koinup.